Grays and Torreys peaks, at 14,270 feet and 14,267 feet, respectively, are two of the most popular 14ers mountains in Colorado. They are often climbed as a pair, thanks to an accommodating trail ascending from Stevens Gulch that links the duo in an 8-mile round-trip. Summer weekends find the trail swarming with aspiring hikers, and even mid-week, hundreds of hikers might set out for these two summits. While the social aspect of the day may appeal to some, it turns out there’s a thrilling, less hectic option up Torreys Peak that starts out of the same trailhead: Kelso Ridge. Kelso Ridge is a class 3 scramble of mostly solid rock that features a daring, exposed-but-sturdy knife edge section just before topping out. For those looking for a more direct line that promises airy views and fun non-technical (but challenging) scrambling, Kelso Ridge may be worth a visit (if you’re uncomfortable with exposure or off-trail navigation, it may not be for you). However, for the scrambler who loves the thrill of ridges, Kelso may become your new favorite route. It is typically climbed without ropes, though helmets are encouraged. If you’re tagging Torreys Peak, it’s a 6.75-mile round-trip if descending the standard walk-off trail back to Stevens Gulch. 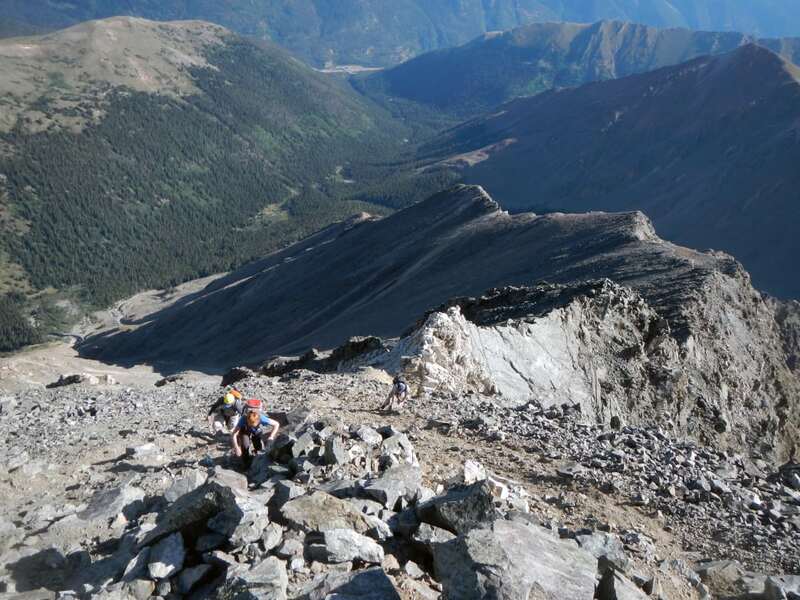 Strong hikers can tack on either Grays Peak or 13,164-foot Kelso Mountain if they want to snag bonus peaks. Grays is actually the easier of the two, but you’ll likely have the off-trail slope walk up to Kelso Mountain to yourself. Kelso Ridge begins at the low saddle between Torreys Peak and Kelso Mountain. 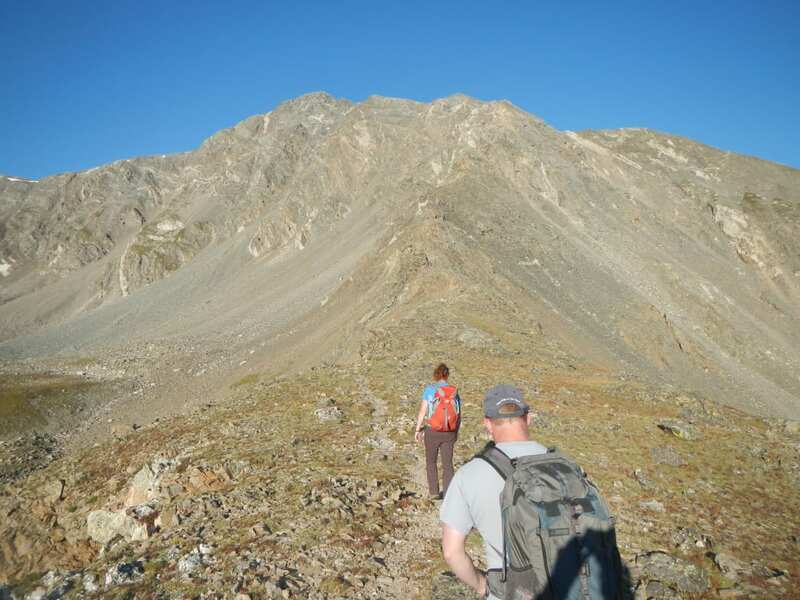 To reach it, begin your hike from the Stevens Gulch Trailhead along the Grays Peak Trail and follow it for 1.8 miles. Here, a small hiker’s trail splits to the right (north) and heads to the low notch, where an old mining cabin sits just below the saddle. This is a good place to put on a helmet and fold away your hiking poles. 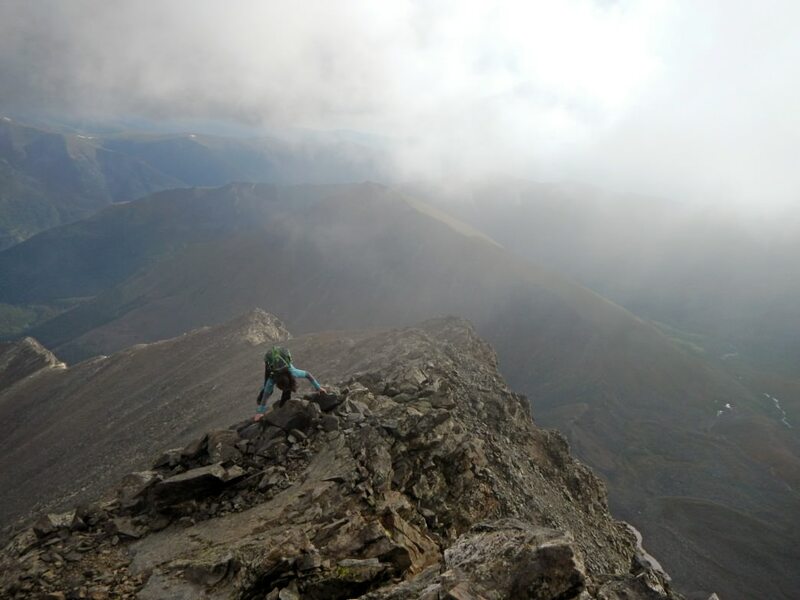 From here, the summit of Torreys is only about a mile away, but the jagged, cracked ridge looks formidable. Turn west and begin your climb. While there are no formal trails along Kelso Ridge, the route is scrambled enough that hikers’ trails have been carved into the land. After a short hike to the ridge, a series of rock outcrops appear, each requiring a bit of scrambling. In most cases, there are detours, usually off the right side, that avoid direct scrambles. The good news is that most direct scrambles are class 3 or easy class 4, so use whatever line seems the most suited to your personal tastes. Until about halfway, the ridge alternates between rock outcrops and smooth-ish sections of improvised trail. Past the halfway point, the route appears to mellow out, especially on a broad section just before the crux of the scramble. The main crux looms just before the final, easy slopes to the top in the form of a large quartz block plastered to ridge and featuring a short (about 15 feet) knife edge that is by far the more daring part of the adventure. Scrambling to the start of the knife edge is in itself a bit heady. The steep, narrow, chute known as the Dead Dog Couloir menacingly waits below. The main knife edge is on very solid rock, though the last seven feet are on a true fin of rock, so scooting across “horsey” style is totally acceptable. The knife edge deposits you on the heart of the quartz block, where one last aftershock of exposure awaits on the easy but initially scary looking but-then-not-so-bad downclimb into the notch at the top of Dead Dog Couloir. Once you are here, you are home free at 14,100 feet. 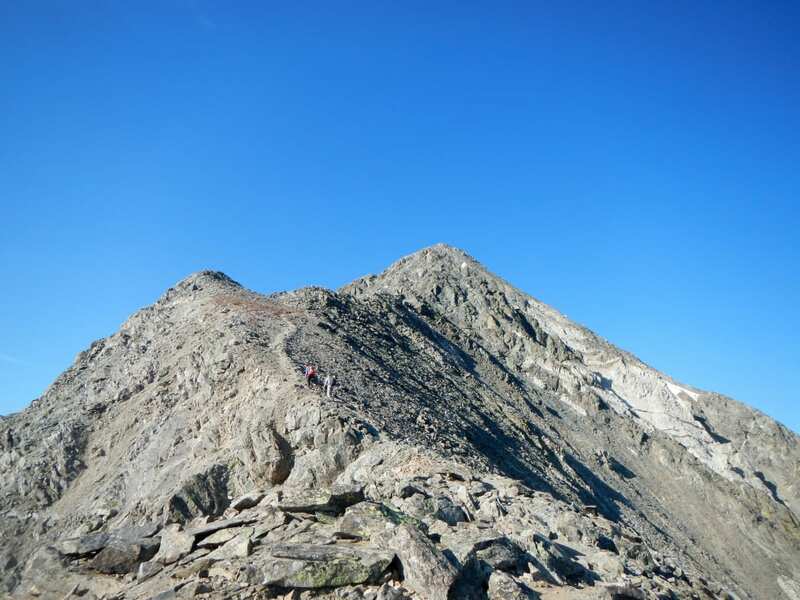 A short, easy walk up the broad shoulder of Torreys Peak will lead you to the summit, where no doubt a throng of hikers will be hanging out. Return via the Grays Peak Trail by descending south to the large, broad saddle between Torreys and Grays. 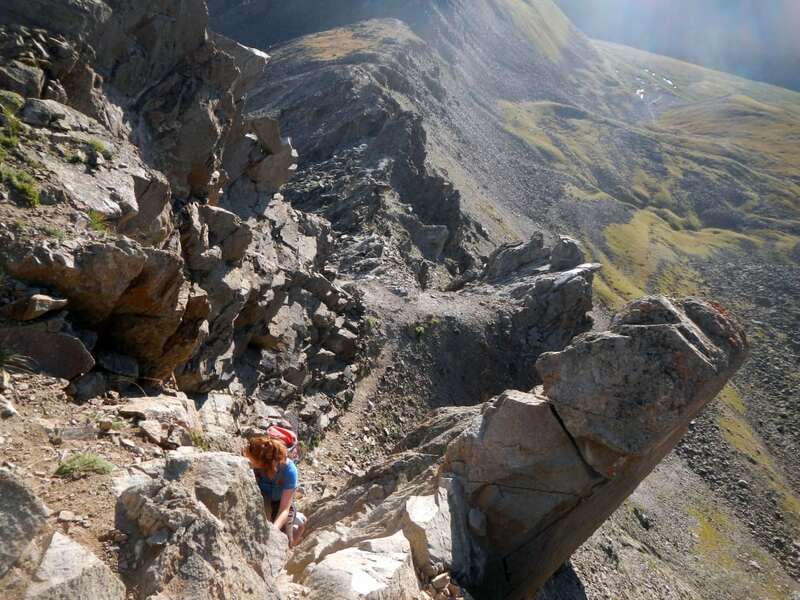 It’s a relatively quick and easy detour to grab Grays Peak and the hike down is easy, so if you’re feeling the need for a second 14er, join the crowds and hike over. Follow the trail back through the valley when you are done for either a 6.7-mile day (just Torreys) or roughly 8 miles if you’re tackling both peaks. Start early—no later than 6 am if you can help it. Not only does this give you a leg up on incoming storms, it helps you get a parking spot at the trailhead, where parking usually fills up by 7 am, if not earlier. Helmets are a good idea, since there is some loose rock and a couple of optional scrambles where it’s possible to step up into a rock outcrop. This is an excellent route that is a perfect example of class 3 terrain in Colorado. It’s solid and exposed in sections, but there’s always a way to back off moves and the fall danger is low. Even the knife edge, airy as it is, can be slowly navigated with a horsey-style shuffle. For those aiming to scramble Longs Peak, this is a great warm-up hike. While the scrambling on Kelso is a little more hands-on than the standard Keyhole Route on Longs Peak, the exposure is very similar. 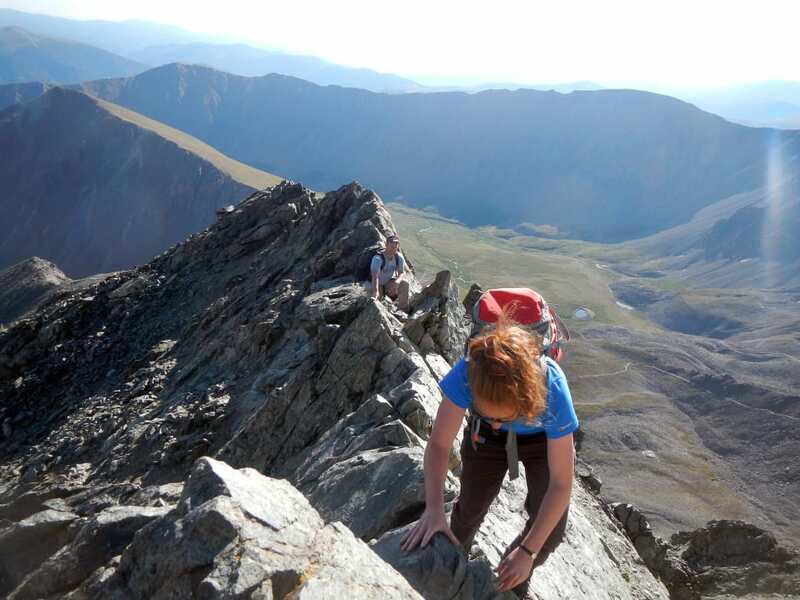 Don’t be surprised to see mountain goats on Kelso Ridge—even on the crux! Strong hikers and scramblers can do this round-trip in four hours or so, but plan to take six for the full journey, especially if adding on Grays or Kelso Mountain. From I-70, take the Bakerville exit, Exit 221 from either direction. If coming from the east, turn left and go over a bridge to a large dirt parking lot. If coming from the west, take a right into this lot. Forest Road 189 is a dirt road that climbs into the woods to the south and goes three miles up to the trailhead. While it’s suitable for Subaru Outbacks (SUVs and trucks will be fine) and similar sport-utility cars, the road is rocky, rutted, and bumpy in places. A good compromise for low-clearance vehicles is to test out the terrain and drive one mile to the junction with Grizzly Gulch. If your car is getting beat up, park here (there’s a road that splits to right, stay straight). The last two miles up alternate between smooth roads and bumpy, rocky sections. Much of the land on the sides is private. The parking lot is large with space for over 40 cars but gets filled up quickly. There are restrooms and camping is allowed in the woods at 11,280 feet west of the private land. The Grays Peak Trail is well marked and begins here.